Paros, one of the most popular and beautiful destinations of Cyclades, and is one of the islands defining the identity of Greek Cycladic Islands. Paros is located in the heart of the Cyclades and it is one of the Greek islands that act as a hub for the ferry connections around the Aegean Sea. You can reach Paros either with regular ferries with cheap tickets or with high-speed ferries that are a bit more expensive option. Find all available ferries and book your tickets now using Ferryhopper's ferry booking engine! The ferry connection from Paros to Athens is served by the ports of Piraeus, Rafina, and Lavrion. During the winter, there are at least two ferries per day from Piraeus to Paros, while in the summer the timetables get denser. The average trip time from Piraeus to Paros is around 4:30 hours for a conventional ferry while with a high-speed ferry it may be only 3 hours. During summer there is also a ferry connection from Rafina to Paros served by both high-speed and conventional ferries. Using this route can be a nice idea as Rafina is quite close to the Athens International Airport. Apart from Athens, Paros is connected by ferry with Mykonos, Santorini, and Crete (Heraklion). The ferries from Paros to Mykonos, Santorini, and Heraklion are usually seasonal and operated by high-speed ferries. However, conventional ones may be also serving this route. Most of the ferries that depart from Paros, also pass by Naxos. There are year-round ferry connections from Paros to Naxos. During summer the itineraries get really dense (more than 10 ferries per day) and the trip lasts less than an hour. Antiparos is a small island near Paros. The connection between Paros and Antiparos is served by several ferries per day, departing from the port of Pounta. These itineraries are not available for online booking, however, if you are traveling without a car, you can keep your mind at rest as you will not face any availability issue. Starting from Paros you can go towards the eastern Cyclades i.e. Amorgos, Small Cyclades (Koufonisia, Donoussa, Schoinoussa, Irakleia) and Astypalaia (it is considered to be in the Dodecanese, but seems like a Cyclades island). Alternatively to all the ferry options mentioned above, you may choose the western route towards Andros, Tinos or even the northern route towards the islands of Northern Aegean Sea. What to do in Paros? Paros has plenty of things to enjoy in summer! In the following stories or suggestions, you may find interesting info to plan your vacation! I have been visiting Paros for the last twenty (!) years, at my small house at Ambelas. Ambelas is a small fishermen village, near Naousa. Ambelas is renowned for the delicious fish that you can eat in its nice fish-taverns that are located on the seafront. According to my opinion, Naousa is the most beautiful small port of Greece with picturesque shops and the mysterious ruins of the old Venetian castle. If you stroll around the white-pink cobbled streets (they are full of bougainvillea flowers) and cross the "kafeneion" of Vaggelis called "Palia Agora", you should definitely try the delicious chickpea plate. The island offers several different kinds of entertainment for all ages and budgets. 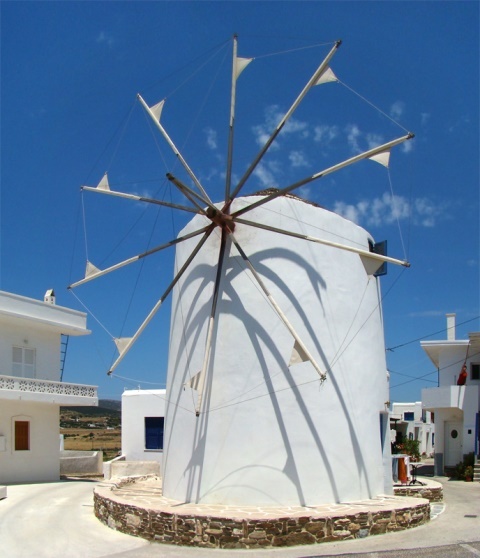 In Paros, there are three well equipped camping sites and there is a well organized public bus network. Especially during August the timetables are quite frequent and there is a bus between the most known villages every 30 minutes. If you also like mountain villages, you can visit Lefkes, a beautiful village with nice food. There you can try the tavern "Pezula tis Lichoudias - Sweet Smelling kitchen" where you can eat delicious Greek cuisine! To sum up, Paros is an island where anybody, independent of what he/she is looking for, can have a great and unforgettable time! How to book my ferry tickets to Paros? Getting your ferry ticket to Paros is now more than easy! Just search in Ferryhopper's ferry booking engine, and let us show you all the available routes, even the indirect ones!